Join us for an evening of empowering the next generation of global leaders. 15-year-old Mongai Fankam has a passion for helping the underprivileged children in Africa and locally in NC by providing them with backpacks filled with school supplies. Her passion for helping other kids started after several mission trips to Cameroon with my mom. At age 3 she went on her first mission trip with her mother. It was at this time and subsequent trips that she realized the majority of the school-aged children in the rural areas, walked to school carrying their books in their hands or in plastic bags. This really bothered her and she decided to make a difference in the lives of these children. At age eight, she challenged her entire school to go to school for a day without their backpacks so as to raise awareness for children around the world who do not have backpacks. 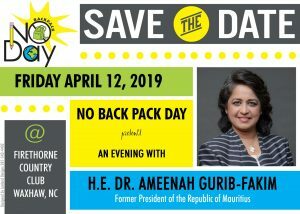 Since then more than 40 schools have participated in this project and donated more than 16000 backpacks filled with school supplies that have been given to children in six African countries and locally in NC to some organizations with similar mission-oriented projects. Through her humanitarian work, she has gained the support of some world-renowned leaders whom she has shared the stage with and they have also endorsed her project. 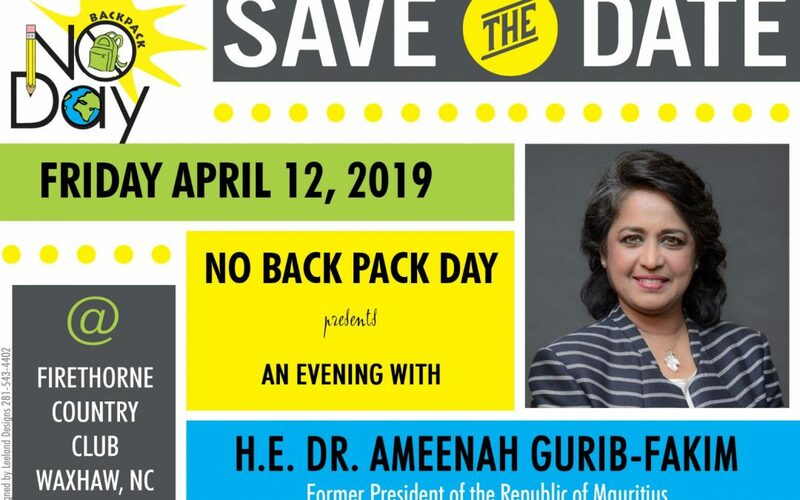 From April 11th to April 15th, 2019 she will be honored to welcome Her Excellency Dr. Ameenah Gurib-Fakim, former President of the Republic of Mauritius, scientist and powerhouse to endorse her and to help her raise funds for her charity. Mongai’s goal is to raise enough funds to buy and distribute 10,000 backpacks filled with school supplies to some well-deserved children in her community and around the world. Her Excellency Ameenah Gurib-Fakim is the Former President of the Republic of Mauritius, Africa’s fourth female president, scientist, activist, and philanthropist. Prior to becoming president, she was the Managing Director of the Centre International de Développement Pharmaceutique (CIDP) Research and Innovation as well as Professor of Organic Chemistry with an endowed chair at the University of Mauritius. Since 2001, she has served successively as Dean of the Faculty of Science and Pro Vice-Chancellor (2004- 2010). She has also worked at the Mauritius Research Council as Manager for Research (1995-1997). Between 2011-2013, she was elected and served as Chairperson of the International Council for Scientific Union – Regional Office for Africa, and served as an Independent Director on the Board of Barclays Bank of Mauritius Ltd between (2012-2015). As a Founding Member of the Pan African Association of African Medicinal Plants, she co-authored the first ever African Herbal Pharmacopoeia. She has authored and co-edited 28 books, several book chapters and scientific articles in the field of biodiversity conservation and sustainable development. She has lectured extensively across the world; is a Member of the Editorial Boards of major journals, has served on Technical and national committees in various capacities. Elevated to the Order of the Commander of the Star and Key by the Government of Mauritius in 2008. She has been admitted to the Order of the Chevalier dans L’Ordre des Palmes Academiques by the Government of France in 2010. Elected Fellow of several academies and societies. 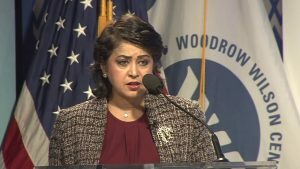 Ms. Gurib-Fakim received several international prizes including the 2007 l’Oreal-UNESCO Prize for Women in Science, the African Union Commission Award for Women in Science, 2009. She is honored as one of 2015 Foreign Policy’s Global Thinkers. She was elevated to the Order of GCSK by the Government of Mauritius and received the Legion d’Honneur from the Government of France in 2016. In June 2016, she was in the Forbes List for the 100 ‘Most Powerful Women in the world’ and 1stamong the Top 100 Women in Africa Forbes List 2017. In 2017, she received both the lifelong achievement award of the United States Pharmacopoeia-CePat Award and the American Botanical Council Norman Farnsworth Excellence in Botanical Research Award. In 2018, she received the Order of St George at the Semperopernball, Dresden, Germany and the Global Energy Parliament Award, State of Kerala, India.